Junior Grayson Hargens shoots a free throw during during the State semifinals against Lynn English on March 11. Ending a 13-year drought, boys’ basketball won the South Sectional title on Friday, March 8, defeating Mansfield 74-64. 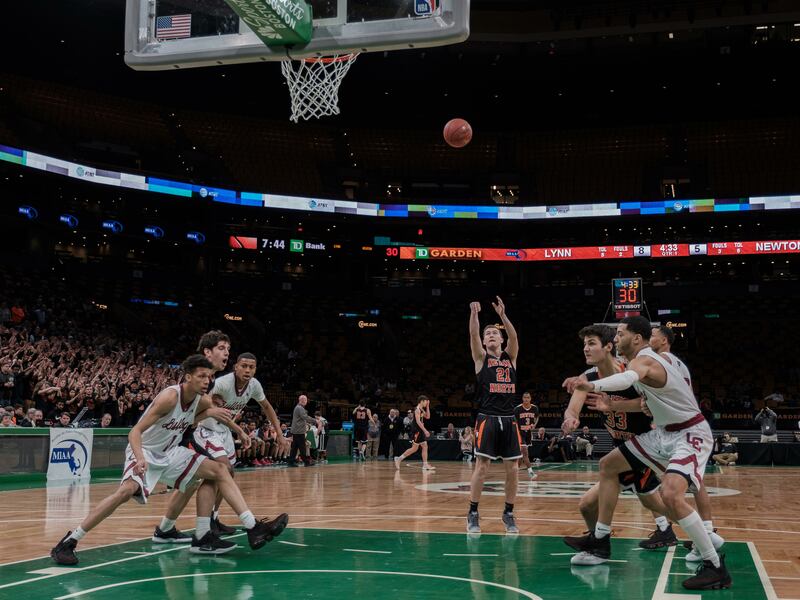 However, the historic run ended last Tuesday, March 11 at TD Garden, as North fell to Lynn English, 74-62, in the Division I State Semifinals. North’s defense started off strong on the defensive end, forcing a turnover and then drawing an offensive foul. However, as the first quarter progressed, the defense began to breakdown. Lynn English’s accurate shooting led to a 18-3 run for the Bulldogs. During the run, Lynn English’s senior Alonzo Linton and junior Jarnel Guzman dropped seven and nine points respectively. Guzman went on to score a game high 22 points, and Linton finished with 20 points. As well, Lynn English’s sophomore Jack Rodriguez finished with 19 points. At the conclusion of the first quarter, North found themselves down 22-10. “Their big three had huge games. If one of them didn’t have the type of game they had maybe we might have been in it a little bit more,” said Connolly. During the third quarter, senior Ezra Pemstein, a captain with senior Christian Negrotti, ripped the ball out of Lynn English junior Mason Jean Baptiste’s hands while he went up for a layup. The block marked a shift in momentum, as North went on a 10-4 run. As usual, Lynn English responded to North’s run. Rodriguez scored eleven points in the quarter, helping Lynn English to regrow their lead to 13 points. Linton and Guzman took over in the fourth, while North looked defeated, turning the ball over in crucial situations. Midway through the fourth the game was sealed and all the starters checked out. North’s top scorers were Duncan and junior Grayson Hargens, scoring 11 and 12 points respectively. North finished the season 21-6 after starting the first seven games 4-3.